Imagine a day when every person on earth has a global government-issued identification card, complete with biometric data. There is no more cash and every transaction is electronically tracked. No one is able to run or hide from the global establishment, as everyone's biometric data has been permanently implanted into their body. You become your own unique, government-controlled ID. Could what reads like a standard Hollywood sci-fi fantasy script become humanitys future reality, making us all virtual cyborgs in just 15 years or less? Indications are that its all being actively planned . And for all the naysayers, its a little late to be in doubt. It's already starting to happen although the transition process has, so far, been generally disguised and subtle. According to a recent article in The Independent: "You no longer have to look to science fiction to find the cyborg. We are all cyborgs now. Mobile phones, activity trackers, pacemakers, breast implants and even aspirins all act as biological, cognitive or social extensions and enhancements of our bodies and minds." Rikke Duus and Mike Cooray go on to say in this wearable fitness write-up that "Several initiatives are even underway to create implantable technologies that could essentially augment human biology. Internal microchips and digital tattoos could replace smart wristbands, payment devices and the like in the next few years". Medical science is not to be left behind. 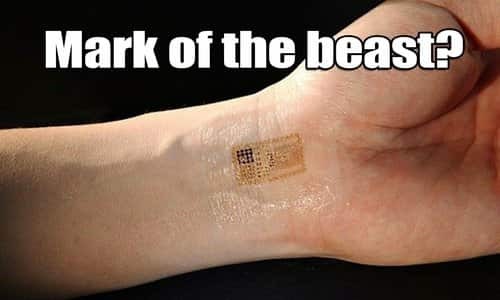 In a recent article published in nature.com, Elizabeth Gibney reports that researchers at Linköping University in Sweden have developed skin-surface and implanted sensors, as well as an in-body intranet that can link devices while keeping them private. Other groups are reportedly developing technologies ranging from skin patches that sense arterial stiffening  a signal of a looming heart attack  to devices that detect epileptic seizures and automatically deliver drugs directly to affected areas of the brain. Some of these trends are not really that original, but heres the game-changer: These next-generation devices are designed to function as an integral part of tissue, rather than be isolated from it like most pacemakers and other electronic devices already used in the body. John Rogers, a materials scientist at the University of Illinois at UrbanaChampaign says that medical sensors woven into the body are a natural extension of handheld smartphones and wearable devices. "I think electronics is coming at you and It's migrating closer and closer and I think it's a very natural thing to imagine that they will eventually become intimately integrated with the body." Certainly there are some medical challenges and privacy issues, but parallel work is going on at various levels to find suitable workarounds and possible compromises against possible 'show-stoppers'. And so the efforts continue. Michael Strano, a chemical engineer at the Massachusetts Institute of Technology (MIT) in Cambridge is starting work with MIT engineer Daniel Anderson on devices that could combine sensors with drug-delivery systems. They hope to adapt microchips pioneered by fellow MIT engineer Robert Langer to respond to a range of triggers by releasing the appropriate drugs, encased in polymer capsules. The first human trial of a drug-delivering 'pharmacy on a chip'  without the sensors  was in 2012 in eight women with osteoporosis, according to sources. In November of 2015, Alex Newman examined the big picture around these developments in a review titled Globalists and UN Push Mandatory Biometric ID for All for the New American. Newman describes the UN's deeply controversial Agenda 2030, marketed as an effort at "transforming our world," as essentially a recipe for global socialism. Section 16.9 of the Sustainable Development Goals proposes: "By 2030, provide legal identity for all, including birth registration". This was interpreted to mean that the UN and its member regimes "are practically putting a bulls-eye on the back of every human being who still exists outside of the globalized economic and political system, such as the hundreds of millions of people who do not have government IDs, bank accounts, government "benefits," permits to exist/build/farm/hunt/procreate/emit CO2, and more". which is widely read to mean global government. Newman explains that Goal 16 is simply a call for a more powerful system of global governance with more power for Third World dictators. He also states that part of Goal 16 is a target to "significantly reduce illicit financial and arms flows." In order to reduce such "illicit flow", of course, money and weapons  along with those responsible for the financial element (buyers and sellers) and gun owners  must also be tracked. And since cash and unregistered weapons are impossible to track, it follows that something needs to change. As Newman concludes, it is no wonder, then, that the UN wants to provide "legal identity for all, including birth registration," to every person on the planet. After all, without such a tool for tracking every person, it would be impossible to track all money, arms, opinions and, ultimately, dissent. Law enforcement has long since jumped onto the global tracking bandwagon. A notable example was given by mid-day.com, which reported in 2015 that in one Indian state named Nagpur, drastic measures were being taken to curb jailbreaks. The state Home Department planned stricter technological measures such as electronic tagging of prisoners through radio frequency identification (RFID) tags. This method is used in India for tracking tigers and other endangered species in forest reserves, in tandem with a Global Positioning System (GPS). Under the new arrangements, the prisoners would carry microchips also known as 'spychips' on their person. Alternatively, the chips would be implanted surgically under their skin. The microchips would have all the data pertaining to each respective prisoner. It was also proposed that jail authorities would be required to record pictures, voice samples, and biometrics of inmates admitted to the correctional facility. Reference to author Michael Snyders pertaining to such developments globally was also made in the New American analysis of the 2030 Agenda. Snyder reportedly argued that the UN is plotting to implement universal biometric identification for all of humanity by 2030. "This new agenda truly is a template for a 'New World Order,' and if you dig into the sub-points for these new Global Goals, you find some very alarming things," he wrote, citing SDG 16.9 on global identification and registration as an example. Citing the UN's partnership with technology firm Accenture to implement a biometric ID program that reports refugee information to a central database in Geneva, Snyder also noted that the UN is already hard at work in making its goal a reality. and to provide refugees with official identification papers. All of that information is then reportedly collected in a database housed in Switzerland. Another media report cited by Snyder, which deals with World Bank efforts to foist biometric IDs on the planet under the guise of a program dubbed "Identification for Development (ID4D)," makes clear that the Accenture identification system will ultimately reach far beyond refugee camps. "Indeed, the push for a global cashless society and the global effort to impose biometric ID systems on every human being are inseparable from each other," Newman wrote, citing examples such as the Ford Foundations 'Better Than Cash Alliance' launched in September of 2012. The Alliance "...partners with governments, the development community and the private sector to empower people by shifting from cash to electronic payments," according to its website. The U.S. government is said to be a key player and supporter, locally via federal control, as well as working internationally with the U.N and related bodies. Notable U.S personalities have expressed their approval as well. Late last year, cnet.com's Eric Mack reported that Transhumanist Party presidential candidate Zoltan Istvan suggested that small microchips could be implanted under the skin of Syrian refugees as part of the process of admitting them into the United States or other countries around the world. Istvan, who recently had a microchip implanted in his own hand to kick off his campaign bus tour, told CNET in an email, "The procedure takes a minute and is harmless. The chip is the size of a grain of rice and could go in the hand and be useful for more than just tracking purposes." And he causeth all, both small and great, rich and poor, free and bond, to receive a mark in their right hand, or in their foreheads: And that no man might buy or sell, save he that had the mark, or the name of the beast, or the number of his name (Revelation 13:16-17).